Dear Teachers, It’s Not Personal. You know what I mean? 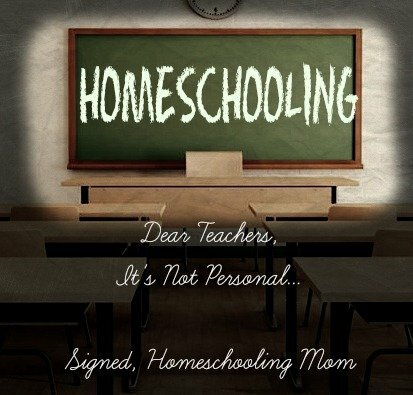 One of my first thoughts after resolutely setting my sights on homeschooling was, “What will all my teacher friends think?” And I’m not talking about one or two casual acquaintances. I’m talking close to, if not more than 50% of my close friends and acquaintances that I consider more than just “casual”. I have some wonderful friends who are wonderful teachers. In fact, of all the teachers I know, I don’t know a bad one! My decision to homeschool has no reflection on the teachers I know. I know that any of the teachers I know would teach and love and care for Bug. I just wish I could guarantee that the only teachers Bug would ever encounter would be the ones I know and approve of. But I can’t. And good teachers aside, there are still plenty of reasons to want to avoid the public school system. So teachers, just know that it’s not you, it’s me. You do wonderful work. You have answered a high calling in your life. And those that view it as a calling and do it well should be greatly praised. But homeschooling moms have a calling too. You, teachers, have been called to take on the masses. We, homeschooling moms (I hope it’s ok that I speak for us all) have been called to take on a few. But a calling is a calling and a teacher is a teacher. Feel free to sound off in the comment section below. Be sure to check out the entire homeschooling category.